The typical red and brown rhyolite rock patterns of Landmannalaugar partially covered by green moss illuminated by the last light of the day. 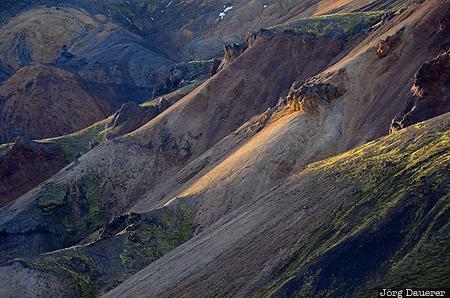 Landmannalaugar is in Suðurland in the highlands of Iceland. This photo was taken in the evening of a sunny day in September of 2013. This photo was taken with a digital camera.